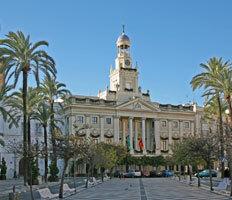 Located on a narrow spit of land surrounded by sea, Cadiz is the capital of the province of Cadiz. Probably the oldest continuously inhabited city in the Iberian Peninsula (Spain), it has a wealth of well-preserved historical landmarks and stunning views. 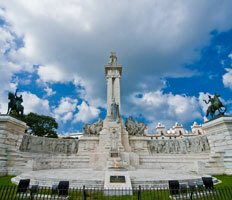 You will find more information about prices for excursions and day trips to Cadiz for small groups and bigger groups here. The Old Town (casco antiguo) is riddled with narrow streets and attractive plazas. 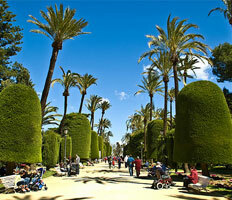 Here you will find the main sights and landmarks as well as a handful of parks full of exotic plants, including giant trees, supposedly brought to Spain by Columbus from the New World. Visit the "Plaza de Mina": located in the heart of the Old Town, as well as being probably the most beautiful plaza of Cadiz, you will also find the museum of Cadiz which contains many objects from the city's 3000-year history. Excursions to "The Plaza de la Cathedral": (Plaza de la Catedral and the Cathedral) where you will find both the Cathedral and the Baroque church of Santiago, built in 1635. Tours to Tavira tower: Cadiz had more than 160 towers in the 18th century, from which local merchants could look out to sea for arriving merchant ships. The Torre Tavira, named for its original owner, is the tallest remaining watchtower of Cadiz. Excursions to the Roman Theatre: constructed during the 1st century BC, it is the second largest Roman theatre in the world. City Gates: known as the "Puertas de Tierra" these gates originated in the 16th century and once consisted of several layers of walls, only one of which remains today. Two side by side arches cut into the wall to serve as one of the main entrances to the city. Genoves Park: well worth a visit, with its theatre, fascinating trees and a little waterfall with a pond and a dinosaur sculpture. Best beaches of Andalucia: these include Bolonia Beach (with its surprising Roman ruins), Punta Candor, Fontanilla, La Ballena, Cala Pato, German Beach and Caños de Meca. 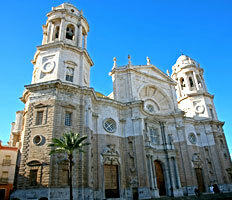 And many, many more places of interest to be found in Cadiz like Tarifa and Jerez de la Frontera. 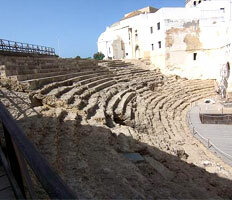 Like the sound of Cadiz and planning a holiday or trip? 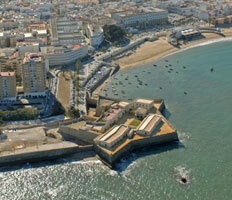 Find out the great prices we can offer you on cheap airport transfers to Cadiz. It’s simply the best possible start to your holiday.